Delegate Kirk Cox takes a photo op with NAMI CVA Board Members. To register for classes, please call the office at 804-285-1749 or email jeff.conley@namicentralvirginia.org. serving president. My name is Vince Cammarata and I am from Mechanicsville, VA where I live with my wife of 32 years, Theresa. We have 3 adult children that live on their own in the Richmond area that attended and graduated from the Hanover County school system and then from Virginia colleges. 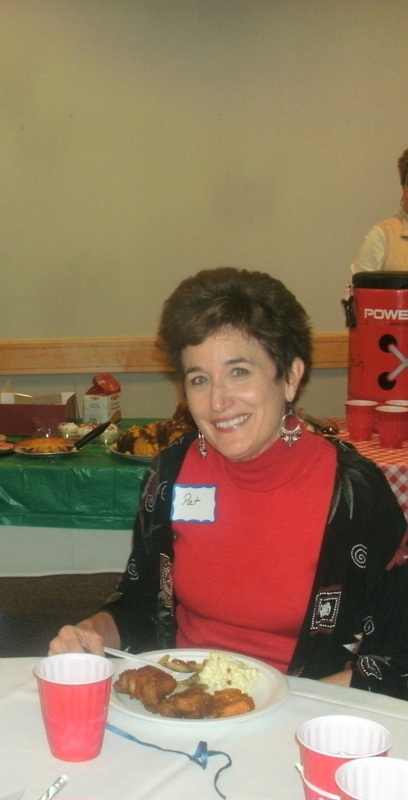 Prior to our board involvement with NAMI Central Virginia, Theresa and I served as facilitators for the Hanover County Family Support Group for 5 years (we were also participating members prior to serving as facilitators). Theresa and I both grew up with family members that suffered from a mental illness and understand the importance and need for organizations such as NAMI and the very valuable programs, education and awareness that they bring to our friends, family and community. When I am not serving with NAMI Central Virginia, I operate a small local business that I established in February of 2004 that provides products and services, with a focus on serving various federal government agencies. Prior to operating my business, I served as a US Army officer in various leadership roles throughout my military tenure. I am a graduate of Alexandria University, College of Law where I earned a Juris Doctorate combined with a Master of Business Administration. Additionally, with my passion as a ham radio operator and electronics enthusiast since I was a teenager, I earned a Doctorate (PhD) in electrical engineering from Trinity College. In closing, I want to thank the NAMI Central Virginia board and membership for their support, endorsement and trust that allows me to serve as your president. I am confident that with our collective collaboration and passion to better the lives of persons suffering from a mental illness/brain disorder and friends and families of loved one suffering from a mental illness/brain disorder, we will enhance their lives, bring community awareness and serve as advocates for these individuals. My door is always open and I welcome any comments, concerns, suggestions or discussions! The January General Meeting marked the beginning of a new year for NAMI-CVA. The new Board Members officially stepped in as of January 8th, including the new president of the NAMI-CVA Board, Vince Cammarata. 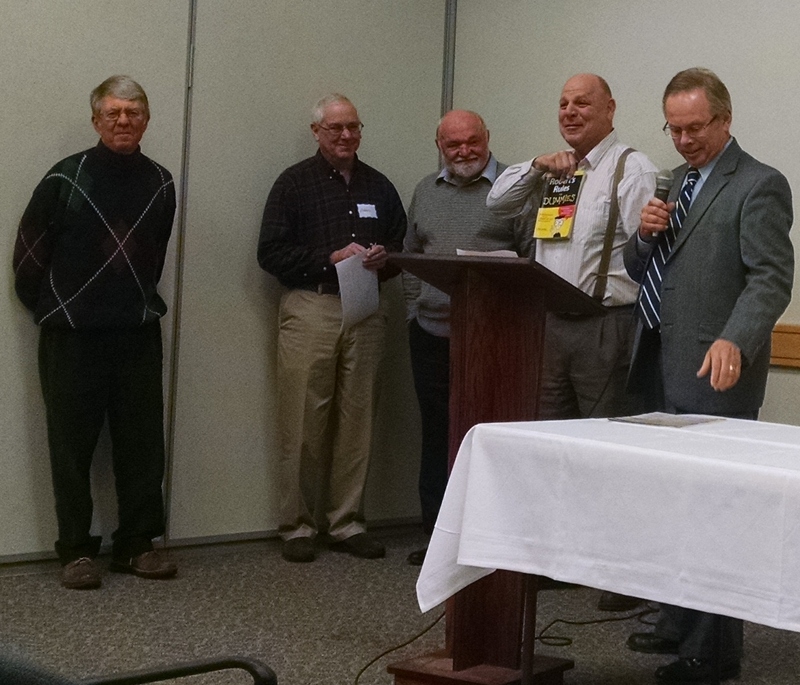 Pictured above is Vince receiving a warm welcome to his new capacity as president by NAMI-CVA Board Officers. Vince was given a book on managing organizations called "Roberts Rules for Dummies," which he accepted with a smile. Outgoing president Rick Stuller offered many kind words about Vince and how excited NAMI-CVA is to have him as part of the organization. 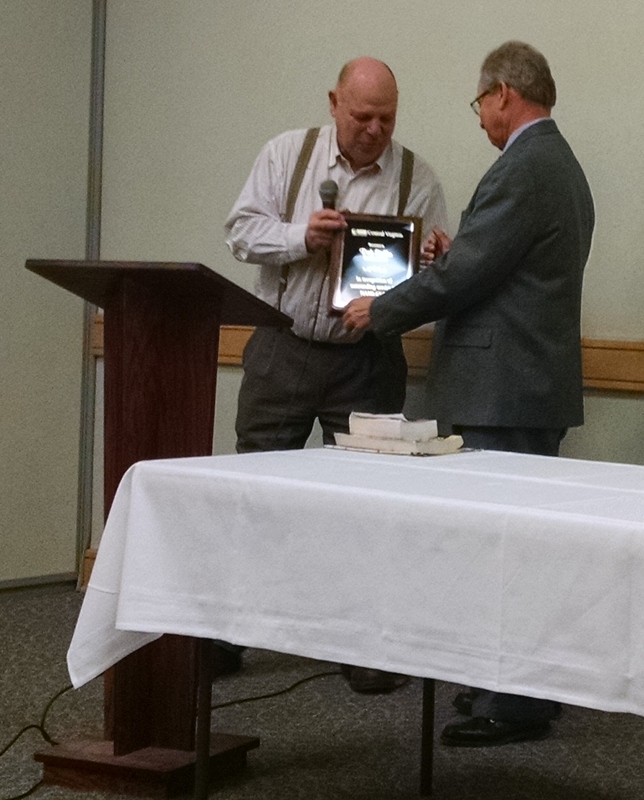 The Board and Membership wished to reward Rick Stuller for his excellent service. He was provided a plaque as a token of appreciation for his hard work, dedication, and overall enthusiasm throughout his years of service on the board and one year as president. Rick is continuing his work with the NAMI-CVA Golf Tournament Committee and remains a strong motivator within NAMI-CVA. In addition to the new president, six other individuals joined the ranks of the 2015 NAMI-CVA Board of Directors. Mike Francisco has returned as 1st Vice President, joined by Darryl Matthews, Jennifer Dishman, Tessa Shuk, Dr. Rev. Gabriella Caldwell-Miller, and Rev. Arcelia 'C.C.' Jackson. The National Alliance on Mental Illness of Central Virginia would like to announce the upcoming Annual Golf Tournament! $1000 Gold Sponsorship includes: Team of four, tee sign, and premier recognition. Tee Sponsorship Signs (does not include players' fees) are available for $175. Small Honor Signs, in honor or memory of a loved one, are available for $35. Come join us for a great day of fun that supports a good cause! For more information about the golf tournament, sponsorship, or golfer registration, contact 804-285-1749 or email info@namicentralvirginia.org. You can download the registration form here. Save the date! The 2nd Annual NAMI CVA Awards Banquet will be held on April 16, 2015 at the Weinstein Jewish Community Center on Monument Avenue, starting at 7:00 P.M.. This event was a huge success last year with wonderful food and over 120 attendees in the room! This year, the Keynote Speaker will be Dr. Kenneth Kendler, who is a world-renowned psychiatrist best known for pioneering research in psychiatric genetics. Dr. Kendler has published a tremendous amount of research regarding mental health, substance abuse, and their genetic roots. He has even helped to develop the Diagnostic and Statistical Manual of Mental Disorders (DSM) over the last few decades. His biography can be found here. The event is free of charge, but an RSVP is required in order to ensure adequate amounts of space and food. Please contact the office at 804-285-1749 or info@namicentralvirginia.org to RSVP. 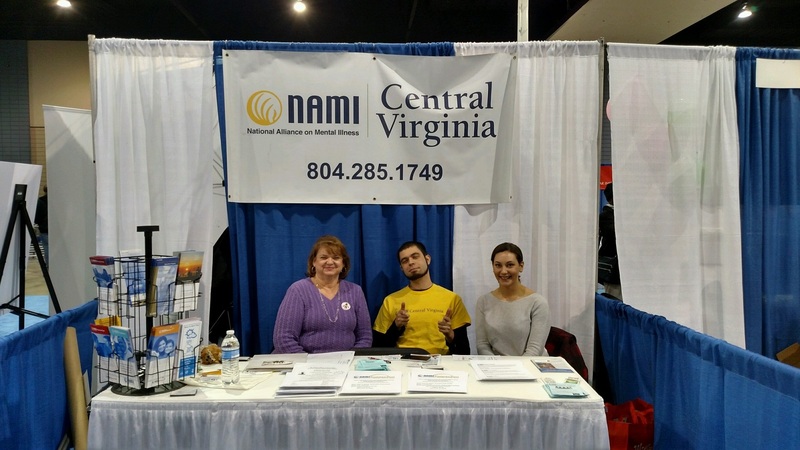 NAMI Central Virginia continues the tradition of having a presence at the CBS 6 Healthy Lifestyle Expo in 2015. On January 31st, nine NAMI-CVA members staffed the booth throughout the course of the day along with two new volunteers: Sami Renehan, a high school student from the Deep Run Dance Marathon Committee, and Olivia Sherck, a student in VCU's Occupational Therapy Master's Program. The CBS 6 Healthy Lifestyle Expo is one of the largest (if not the largest) health fairs in the Central Virginia region. Hundreds of people from the community stopped by the NAMI-CVA booth to chat, sign up for classes, and grab some health fair trinkets! By the end of the day, most of the literature and novelties were in the hands of the attendees. What a great way to spread awareness about what NAMI Central Virginia does and how lives can be improved! Upcoming Health Fairs: Volunteers Needed! NAMI CVA Now Offers Pledge Direct! 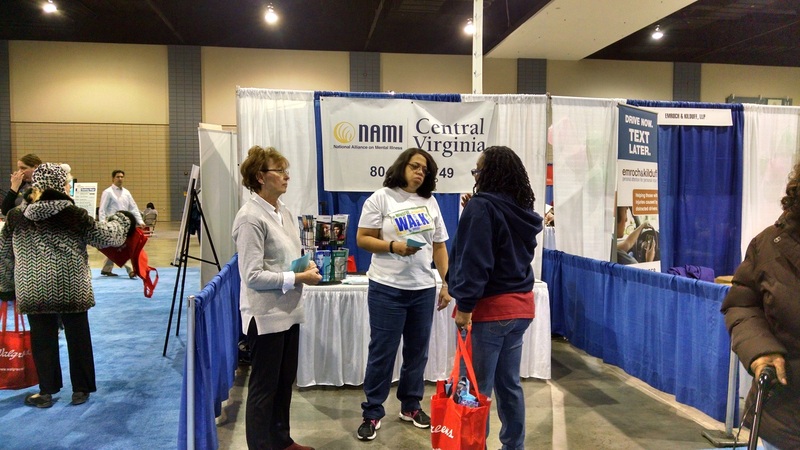 NAMI Central Virginia is bigger than ever in 2015 and the number of programs continues to grow! The demand for these programs can only be met with the help of our wonderful volunteers. NAMI Program Trainings occur throughout the year in various parts of the state. While a couple of trainings are pre-scheduled for Central Virginia this year, additional trainings can be brought to the area with enough qualified candidates. ​This free 12-week course, taught in 49 states and around the world, is for family members and/or caregivers of individuals with mental illness. You are not alone. The curriculum focuses on panic disorder, schizophrenia, bipolar disorder, obsessive compulsive disorder (OCD), borderline personality disorder, post traumatic stress disorder (PTSD), and co-occurring brain and addictive disorders. Family-to-Family discusses treatment for these illnesses and teaches skills that families need to cope when their loved one is experiencing crisis and relapse. It also provides guidance on how to locate appropriate supports and services within the community, communicating effectively, and expressing understanding and empathy for loved ones living with mental illnesses. Recent research, advocacy skills, medication awareness, and self-care are included in the curriculum. The class follows a structured format, in a confidential setting, providing emotional support, information and resources, and coping skills. Peer-to-Peer is a free 10-week course taught by individuals living with a mental illness who have completed special training as mentors for others in recovery. The course includes education on individual empowerment, family and peer support, relapse prevention, communication skills, advanced directives, mindfulness exercises, and more. Peer-to-Peer provides tangible resources, survival skills for working with providers and the general public, exercises to help focus and calm thinking, and a “relapse prevention plan” to help identify feelings, thoughts, behavior, or events that may warn of impending relapse and to prepare ways to cope before they are needed. The class follows a structured format, in a confidential setting, providing emotional support, information and resources, and coping skills. In Our Own Voice is a free, 90-minute, public education program featuring personal stories of recovery and hope. It is a unique informational outreach program developed by the National Alliance on Mental Illness (NAMI) that offers insight into the recovery now possible for people with severe mental illness. IOOV presentations consist of compelling and personal testimonials, a short video, and time for audience questions and discussion. Target audiences include consumers, mental health service providers, families, students, law enforcement personnel, professionals, faith members, and all people wanting to learn about mental illness. Parents and Teachers as Allies focuses on teaching parents and teachers about the early warning signs of mental illness in order to help get those with mental illness into early treatment. P&TasA focuses on the specific age-related symptoms of mental illness in youth. The program lasts two hours, and aims to help schools communicate with families when issues arise. An educational professional, who is also a family member. A parent or caregiver of a child with mental illness. A mental health consumer that experienced the early onset of mental illness, usually before age 18. Lead Presenter - An adult who is either a family member or an individual living in recovery with a mental illness. Young Adult Presenter - An adult (ideally 18-35) who is living in recovery and can relate well to youth ages 13-18. The study also seeks 3 other members of the family who are willing to participate. All family members must be at least 18 years old. The study involves a clinical interview and a blood draw. Participants who complete the study receive $130. Study is not restricted to veterans, but is open to the general public. Help Raise Funds for NAMI-CVA! For the last eight years, Deep Run High School has held a successful fundraiser known as the "Deep Run Annual Marathon Dance." The Dance is a 27-hour celebration. As part of the Deep Run Marathon Dance, students from Deep Run High School collect money for charities that affect the community. Since the inception of this event, Deep Run has raised $1.3 million! This year, NAMI Central Virginia was one of twelve charities selected by the Deep Run Marathon Dance student committee to receive a portion of the proceeds! There are still several exciting fundraising events that lead up to the Dance. Many of these events are fun for the whole family, and all of them raise money for the charities! Below is the calendar for the fundraisers. Please encourage friends and family to come join the fun and support NAMI Central Virginia! Please tell people at the event you attend that you are with NAMI Central Virginia. A new type of clinical-visit is being explored in the world of mental health care: Video Therapy. This type of therapy utilizes modern video-chat technology similar to services like Skype or FaceTime. Such services allow for individuals to receive care in their home environment via video chat. Doctor-On-Demand is one service that provides Video Therapy. Patients who sign up are be linked to doctorate-level Psychologists (or various other doctors) using a safe, secure video platform. This allows for doctor visits without having to leave the house. This may be of benefit to those that are experiencing health conditions that prevent them from leaving the house. You can visit the website www.doctorondemand.com/psychology for more information on this particular program. The video platform is currently only available using the web browser Google Chrome or through a mobile app downloaded through the Apple Store or Google Play. NAMI CVA would like to share a little bit about the wonderful volunteers that do so much important work. The e-newsletters will now feature a section called "Volunteer Spotlight." This first Volunteer Spotlight features Mrs. Pat Stewart. Pat volunteers in many different capacities. She is one of CVA's Family-to-Family mentors and presents as a Family-member at Crisis Intervention Team training for the City of Richmond. Pat also volunteers in the office on a regular basis making contacts with consumers that provide their information after attending programs such as In-Our-Own Voice, as well as helping to prepare mass-mailings that go out to members. She also regularly assists with service at events such as the Annual Picnic, the Holiday Party, gift wrapping, and the NAMI CVA Awards Banquet. A huge thanks goes out to Pat for her dedication and willingness to help out!